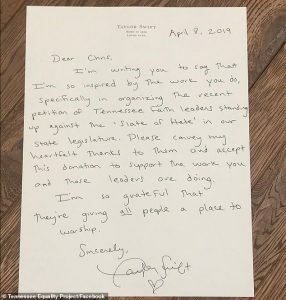 American singer Taylor Swift show support for LGBTQ rights in her home state of Tennessee by donating a generous amount of USD 113,000 to an organisation called Tennessee Equality Project (TEP). The organisation has been working to keep state lawmakers from passing a series of bills that Swift and others characterise as a “slate of hate”. She criticizes in the past for her refusal to discuss politics despite her influential platform. But Taylor Swift made her voice heard on Monday when she donated $113,000 to the Tennessee Equality Project (TEP). An organization fighting to protect LGBTQ rights in the Volunteer State. The organization share a hand-written note from the 29-year-old pop singer about the donation. Why she felt so “inspire by the work” the organisation does. The Shake It Off singer addresses her note about to Chris Sanders, executive director of TEP. Posted a photo of Swift’s. Letter on the organisation’s Facebook page and praised the singer for her gift. ‘I’m writing to you to say that I’m so inspire by the work you do. Specifically in organizing the recent petition of Tennessee’s faith leaders standing up against the ‘Slate of Hate’ in our state legislature,’ she began. ‘I’m so grateful that they’re giving all people a place to worship,’ Taylor concluded (emphasis hers). The ‘Slate of Hate’ references six bills recently introduces in the Tennessee Legislature. If passed, one of the bills would attempt to ban gay marriage (violating US Supreme Court precedent), according to NBC News. Sanders celebrated the former country icon as he announces her donation. 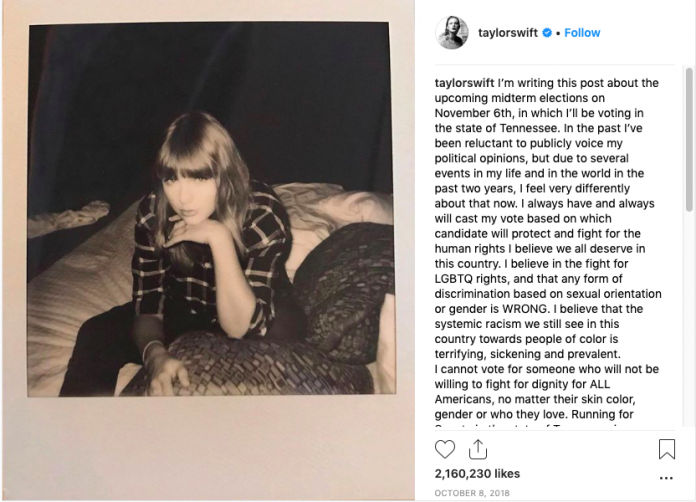 ‘Taylor Swift has been a long-time ally to the LGBTQ community. She sees our struggle in Tennessee and continues to add her voice with so many good people. Including religious leaders, who are speaking out for love in the face of fear. The major donation is nearly as much as TEP’s operating budget for an entire year. Taylor’s relative silence around the 2016 election opens her up to charges from many fans. and cultural critics that she was too disengaged from real-life concerns. Since then, she’s been more vocal about her political allegiances. Including her support of former Tennessee Governor Phil Bredesen for his failed 2018 Senate run. In addition to donating for political and social causes, Taylor has supported arts institutions in the past. She donated $50,000 to the Seattle Symphony in 2015. After being blown away by a recording of composer John Luther Adams’ Become Ocean. A premiere by the orchestra in 2013. Next articleToday! National Siblings Day 2019 Celebrates with your brothers and sisters: Know more about Siblings Day?